HMRL with other conducts the "Smart mobility start-up festival"
Three wining solution has been adopted from Smart mobility start-up festival. Which was focused to get appropriate solutions to the traffic problems in the city from our young entrepreneur. 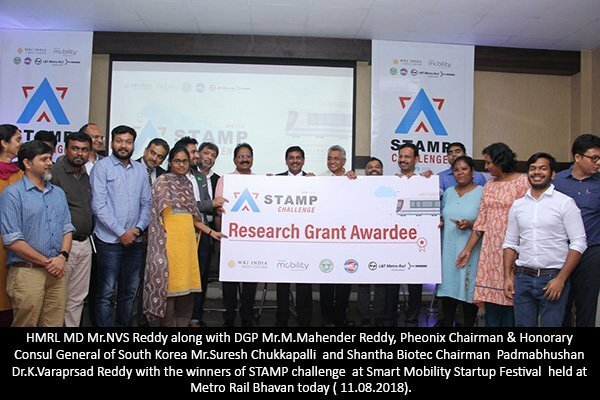 Hyderabad: On 11 August, 2018 Hyderabad Metro Rail Limited (HMRL) conducted “Smart mobility start-up festival” at Hyderabad Metro Rail Bhavan. HMRL with World Resources Institute (WRI) of India, Toyota Mobility Foundation (TMF) and L&TMRHL conducted this festival. This is a culmination day of the Station Access and Mobility Program (STAMP) challenge approximate of 85 interesting products / solutions received from young entrepreneurs. In the second round 11 were selected and the final pitch was made by them to a distinguished jury at Metro Rail Bhavan . At Metro Rail Bhavan approximate 30 start-up products/solutions were also displayed which mainly consist electric vehicles (cycles, scooters and cars), shared mobility and app based mobility solutions. Mr.NVS Reddy, Dr.B.V.R. Mohan Reddy, Mr.Suresh Chukkapalli, Principal Secretary, Transport Mr. Sunil Sharma, Commissioner of Police, Hyderabad Mr. Anjani Kumar, Addl. Commissioner of Police Ms Shikha Goel and other senior officers and several industrialists visited the stalls, keenly observed the products displayed and interacted with the aspiring entrepreneurs. Mobycy, a dockless multimodal shared mobility app that deploys smart bicycles, ebikes and e-scooters through QR code access, with facilities for anyplace pickup and drop-off. Three Wheels United (TVU) & Bykerr provides on-demand integrated smart electric auto rickshaws as first and last-mile solutions to the metro with a one-time booking for an end-to-end ride. The Journee, an integrated ticketing and analytics solution that enables seamless multimodal integration through pre-booking services and optimized public transport operations based on real-time data. All the participants, industrialists and experts from other cities have hailed the initiative of HMRL as unique and thanked Mr.NVS Reddy for implementing innovative ideas to address traffic congestion problem and to give Hyderabad a competitive edge.